I’m really pleased to be joined by Emma Salisbury today who has been a guest on my blog before. She has taken part in my author spotlight feature (read that here) and I have reviewed the first in the DS Coupland series, Fragile Cord (read my review in among some mini-reviews here) and the third One Bad Turn (read my review here). Not quite sure how I seem to have missed the second book in the series! 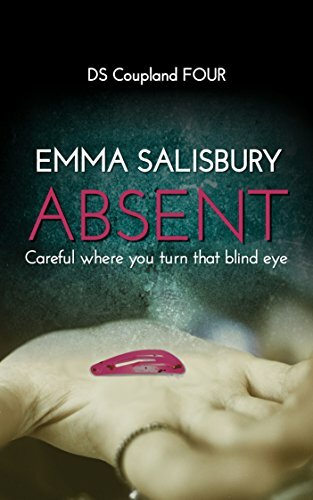 The fourth in the series, Absent, will be published on Saturday and I’ll be reviewing it next week. Today Emma is sharing #TenThings she’d like her readers to know about her including details of the fourth in the Coupland series. I write crime fiction that packs a punch. I have two series – a Manchester police procedural introducing DS Kevin Coupland. Kevin is the wrong side of forty, overweight and overworked, battling the powers that be as he tries to get on with his job despite the bureaucracy going on around him. Readers have described the series as a realistic portrayal of overworked police and conflicting priorities based around characters they identify with. My Edinburgh gangland series follows Davy Johnson, an anti-hero as he battles against the establishment to prove his innocence following an altercation with a rogue cop. I secured a literary agent within three months of submitting my first manuscript, little realising it would be another four years to publication. Top crime writer Mark Billingham told me once that landing an agent gave you an 85% chance of becoming published; trust me to be one of the 15%! Self-publishing on Amazon was the best career move I ever made. In June last year I received an Amazon ‘All Star’ award for being one of the most read authors on Amazon in the UK. Best-selling crime fiction author Ed James lives near me in East Lothian, he met with me when I started out and gave me some top advice; his partner Caireen Harrison designed my book covers. Even though I’ve made Scotland my home I am a Manchester girl at heart and when I’m channelling Coupland I play Oasis and James to get me in the right mind-set. When I’m not writing I love to cook, especially if it’s for someone special. I can’t do any of the fancy presentation stuff but if it tastes good I’m happy. I love to eavesdrop. That’s often where I get some of my best ideas, hearing half a story and making up the other half. People have no idea how much information they give away talking into their mobile. Being a crime fiction writer has its challenges. I love going for walks but instead of seeing a beauty spot I often see a potential burial ground. Luckily friends have got used to my warped view of the world!